Home / Projects / It’s Amazing What A Little Paint Can Do! It’s Amazing What A Little Paint Can Do! It’s amazing what a little paint can do! I’ve had a lot of fun over the years creating clever visual effects for a myriad of interior scenarios…with a little paint. Paint, in it’s infinite hues, can communicate so much…mood, feeling, style, and spirit. A painted surface is beautiful in and of itself…but, I’ve never been one to leave well enough alone. It’s blissful to play in the studio, push the envelope to explore and experiment with the spectrum of possibilities. Always striving to create one-of-a-kind hand-wrought finishes, I’ve been absorbed for hours, days, weeks, months, years rendering sample board after sample board of …”what if.” Working in my studio is a soul searching of sorts – a yearning to create something resplendent, admirable, exquisite, alluring, or interesting at the very least! Ideally, your home should be a sanctuary. My patrons truly appreciate custom tailored design elements that are a reflection of their unique personality. I’m always up for a challenge, and am happy to execute the ‘exact look’ a client has in mind, or brainstorm 101 ideas for them to pick and choose their favorite. 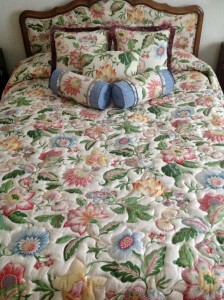 A bouquet of flowers were selected from the fabric design. 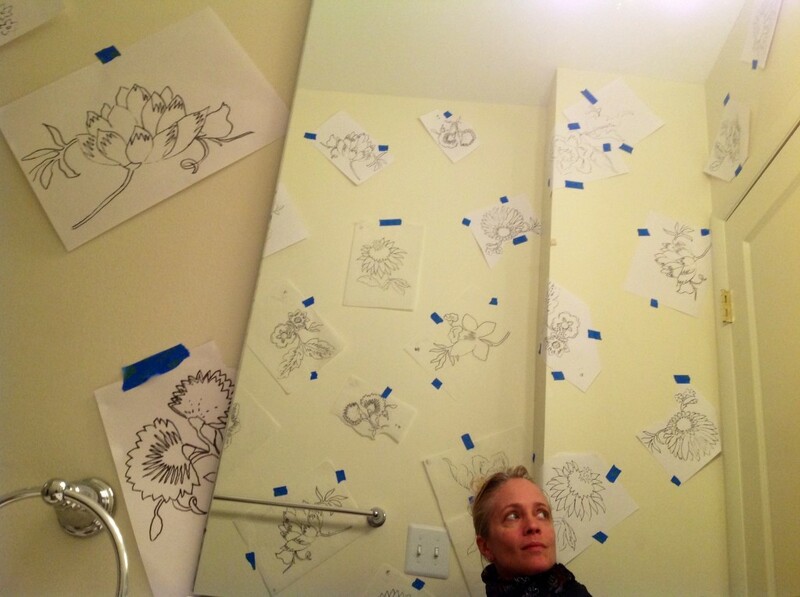 I sketched several & made copies to assist with composition layout on the master bath walls. Layout complete…taking a deep breath before custom mixing colors on my palette. 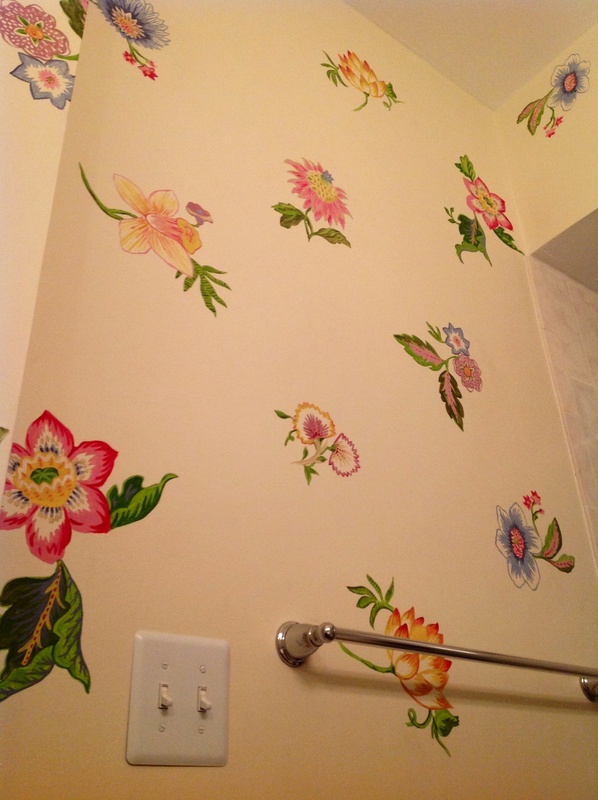 There were many benefits to hand-painting vs. wallpapering the master bath walls. 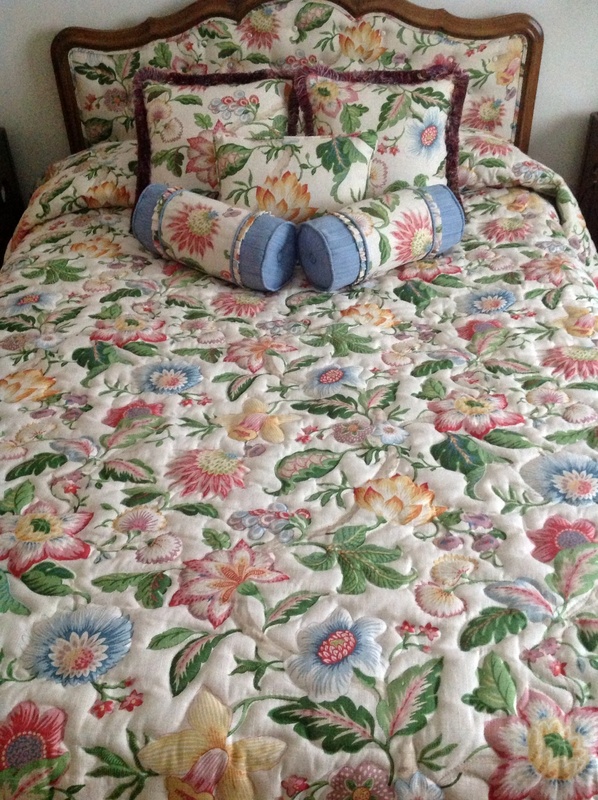 We kept the flowers sized to original scale, but chose to space them apart more than the fabric. This insured the intimate room would not feel ‘too busy.’ Authentic in nature, there was a truly hand-wrought painterly look to the flowers – soft brush strokes were evident upon close inspection. But, my favorite pitch was the fact that there were no seams and the finish would be everlasting. 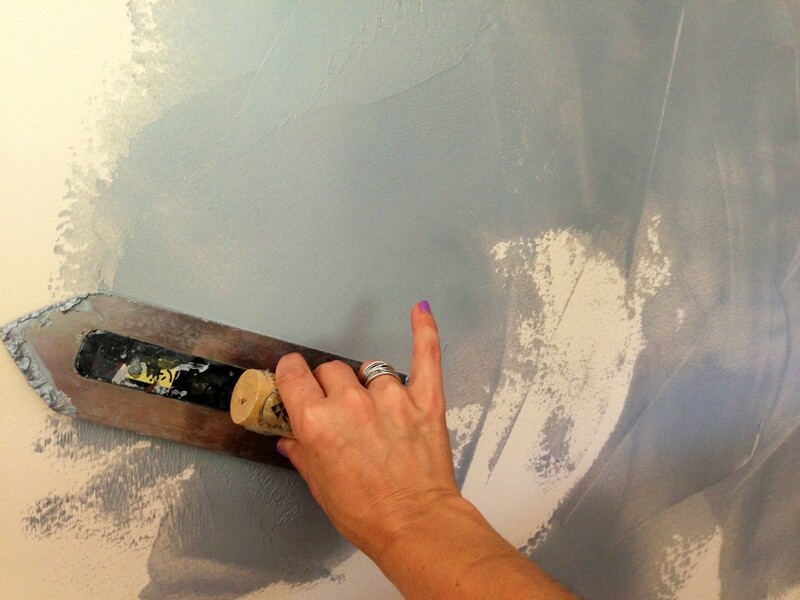 Unlike wallpaper, my faux finishes and decorative painted walls are easy to retouch. Custom finishes are a good investment, that can be maintained and enjoyed for a lifetime. 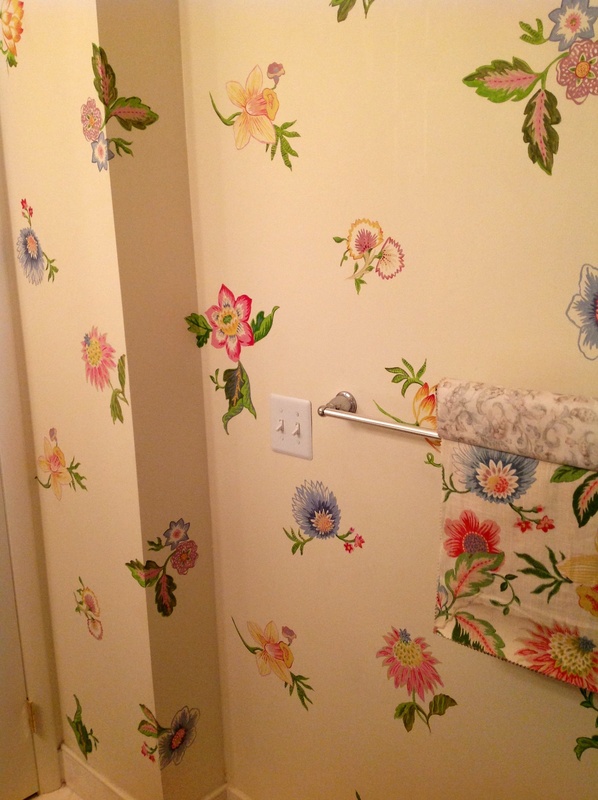 Furthermore, wallpaper is mass produced. This hand-painted finish, being one-of-a-kind, was unique to the Meyers home…created especially for them. In the midst of progress. 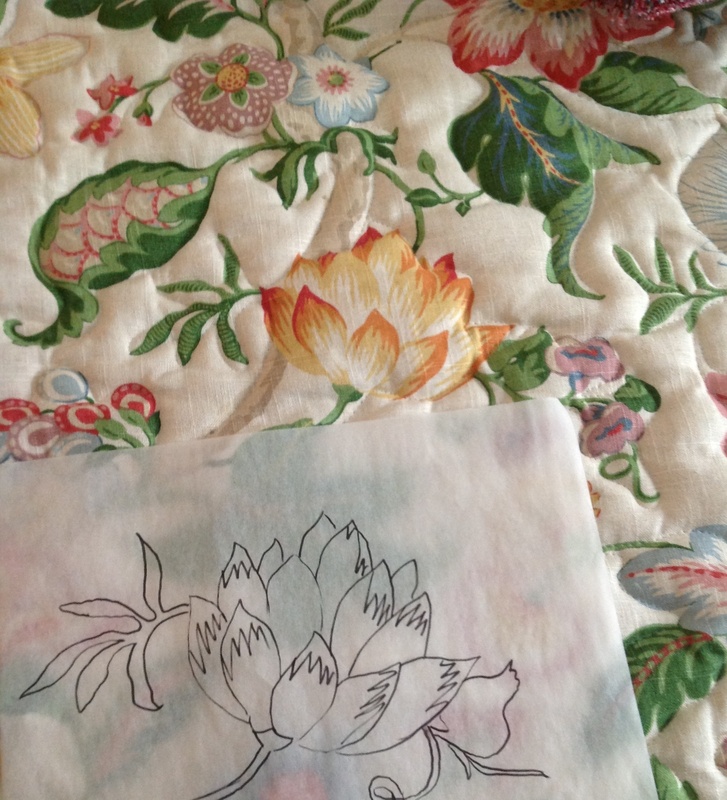 I intently worked on one flower at a time, over the span of three days to completion. It was a pleasant meditative study on form and color. The fabric swatch was always handy for reference. A lovely retired couple, Mr. & Mrs. Meyers, were thoroughly entertained by the creative process of bringing this concept to fruition. They brought tea, lemonade and snacks with frequent peeks to check on my progress…pausing a while in the threshold to observe the leaves-n-petals being painted. The eve I finished, the Meyers insisted I join them for a delicious home-made dinner. During our delightful, animated dinner conversation I discovered this seemingly modest couple led a very blessed, fascinating life…with a beautiful family, worldly travels and a successful office supply business that evolved to become Staples. 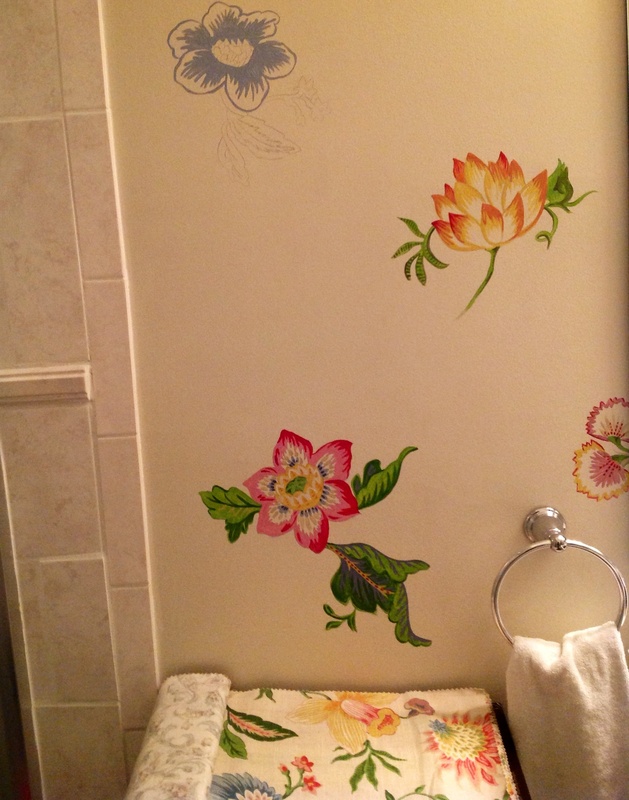 Upon parting, they gave me a huge hug – gushing how much they loved their master bath. Of course, this made me happy ten-fold. With much gratitude to Freeman Interiors for another fun project collaboration!